My Thoughts: I found A Noble Groom to be an interesting story with a plot that I can't remember reading before. One of my favorite things about novels by Jody Hedlund is that they are all rooted in actual events, or are based on a real person. I love that. What made me enjoy this book specifically was the story of German immigrants leaving the Old Country for a better life (something my ancestors did for similar reasons). Annalisa was a young widow who had given up on fairy tale love and happily ever afters. She was realistic. She couldn't run a farm herself and as long as her husband (chosen by her father) was strong and dependable she would make do. Enter Carl Richards, a man who was kind, treated her like a person rather than a servant. Who entertained her daughter rather than ignoring her. His kindness, gentleness, consideration and charm begin to break a hole in the brick wall she had built around herself. With each smile, laugh and open direct conversation with Carl, Annalisa realizes that perhaps there is something more to life than how she had been living. What happens when loyalty to family, honoring traditions and doing what is expected of you collide with the possibility of love and A Noble Groom? 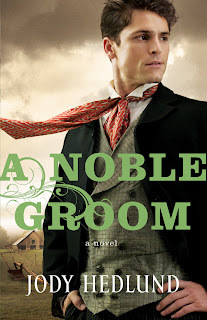 Ms. Hedlund writes an engaging story that answers that question and gives you insight into real people and events from the 1880's along the way. Would I Recommend This Book? Yes. I love history and have always enjoyed that Jody Hedlund's books are based on real people, or real historical events. She integrates so many genres into this book that it was hard to put down. A little mystery, historical fiction, romance, action all rolled into one really well written novel.